Webcam-Mate now OFF Webpower's servers? In a previous blog entry, I proved a connection between Streamate and Webpower (supposed rivals). A very interesting find. 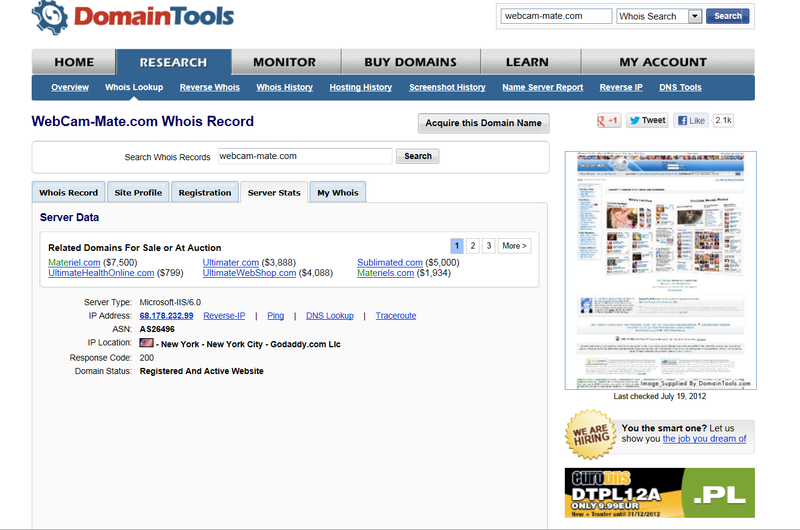 A recent change was made to the Whois record, showing the servers are no longer on Webpower! What a shocker. I mention it and shortly thereafter, a change is made. It’s like magic and not an unfamiliar scene, either. Lest we forget that ICM Registry’s response was to change the information, or how it ‘appears’ in the Whois records. Why go through all that trouble? Why the need to scatter and hide as soon as someone points out the obvious? It appears that Webpower’s got their hands in everyone’s pie. The last screenshot in that blog post shows Webcam-mate on Webpower’s servers. Now, if you look at the Whois record, you will see that it has been changed to show that they were placed on Godaddy servers, nice and snug as a bug in a rug (or a cockroach in a hole in the wall). Godaddy is like the big brother that everyone likes to run to for protection when they know they’ve done something wrong and need to hide. The screenshot of Webcam-Mate.com (as seen on the right side of the page in the screenshot below) shows the iFriends V2 platform’s layout. Rivals working together and hiding it? Something is terribly wrong with this picture, but it is not unfamiliar territory altogether, is it? There are a LOT of similarities these days with Streamate acting like Webpower. This doesn’t surprise me one bit. I’d be willing to listen to any valid argument anyone presents to explain this. I’ve yet to hear anything on the last post. Interesting stuff, I must say.